QX47480 MANSKI, LEONARD. Submitted by Dennis Manski (son). My father Len Manski passed away one week after my mother in October 1957. I was not yet eight years of age when he died but my memory of him burns as bright today as it did then. My parents left four kids with ages ranging from four years up to my oldest brother who was fourteen. Luckily, our Grandmother took us in and we were saved from an orphanage - thank God when you hear of what went on in them those days. I was aware that Dad had served in the Pioneers although not much was said about the time but I know he still got the occasional bout of malaria even then which was a hangover from the New Guinea Campaign. Before Dad enlisted, he was a professional fisherman who worked the waters of the Mary River which flowed through his home town of Maryborough, Queensland into the Great Sandy Straits and Fraser Island. He fished for Barramundi, King Salmon, Mullet, Mud Crabs and Bananas prawns. He continued as a fisherman after the war and up until his death. Dad initially tried to enlist into the A.I.F. in 1940 but was knocked back by the manpower organisation due to him being classed as a Primary Producer. He was successful in enlisting in February 1943, was allocated to the 2/2nd Pioneer Battalion and joined the unit just prior to embarkation to New Guinea. It was during his service in New Guinea that he contracted malaria and my grandmother told me that when he came home on leave after New Guinea he spent more time in hospital as a result than he did at home. I would like to know if he was in B Company in New Guinea so I can fill in that part of his service and I hope someone out there may remember him. In 1986 I did enquire through the Pioneer Newsletter about him and I got three replies. One was from the Quartermaster of the battalion former Captain A. McInnes and from D.O. (Mick) Smith another officer who had a remarkable career with the 2/22 Battalion on Rabaul before he became a 2/2 Pioneer. Both those men told me of Dad's fishing excursions whilst in North Queensland and on Borneo after the war where he caught fish to augment the Battalion's rations. I vaguely remember being told he was also used to crew a vessel to collect Japanese P.O.W.s from camps after the war had ended and where he procured Japanese fishing nets for the purpose described above. I still have his original Battalion colour patch and a necklace he got from the Dayak natives in Borneo. I think the teeth may be either dog or monkey but am not sure. 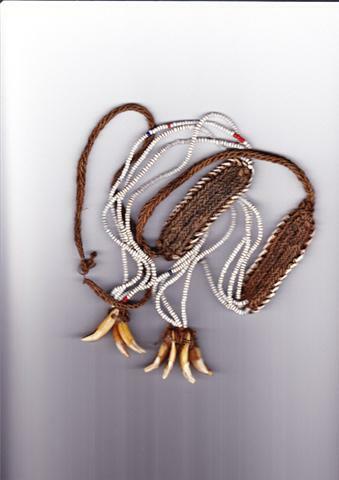 The item is made out of woven string with small beads and the edges around the two rectangular sections look to be made from small sea shells. I am currently writing a family history and am always on the lookout for photographs or stories from anyone who may remember him. It is now 53 years since he passed away so I figure I need to do something for my future generations before the memories are lost forever. So if there is anyone out there that may have some recollections I would be very happy to hear from you.